And thats exactly what Freddie Mercury had. It will be 17 years this coming November 24th that the world of Rock ~N~ Roll lost one of it's most prolific and legendary members. 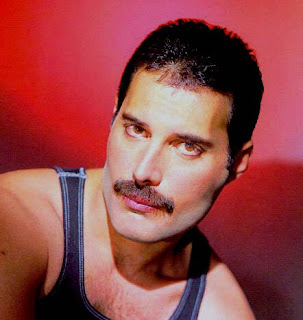 Farrokh Bulsara also known as, Freddie Mercury. Front man for the band Queen but in reality, Freddie was "the" front man of Rock. He lived a rather eccentric life and participated in many things that, a lot of people didn't take a liking to but underneath it all, was the heart of a poet and a voice that had to have come from Heaven itself. Even after all these years, I can sit down and put on a Queen album or even one of Freddie's singles and, you can hear and feel with each and every note, the mans soul that slices it's way straight through to your core. His voice was too amazing for words. He put his heart into all of his work and with every single note that comes out of his mouth, you can feel him singing from the deepest parts of his soul..
Gone from us all too soon, he left his mark on Rock N Roll history and also on the souls of the hundreds, of millions of fans around the world. There isn't one song that Mercury performed that there isn't one person who can't say, hasn't touched them in some way, even if a small way, the mark was left. How many people in this world can you say that about? He was the consummate showman, the legendary singer who was also a warm hearted gentle man who brought happiness to countless members of our human race. A contribution that will be felt for many decades to come. His passing was one of utter shock and disbelief and to this day when we see him in old concert footage or videos on TV, it's still hard to process that this man who was SO full of energy, creativity and life is no longer amongst us. The day that Freddie left us, he also left a void in the hearts of the many who loved him among those who knew him personally, and those of us who knew him personally only through his music which was always very telling if you sat down and listened to each song, word by word and contemplated each verse. And, While The Show Must Go On, we pause for a moment and say thank you Freddie.You will always be missed, always be loved and You will always live because your music will never die.